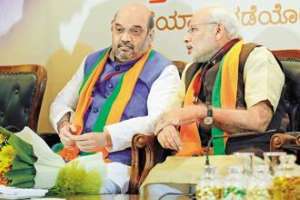 New Delhi: Up against a united opposition and with some of its key leaders under scrutiny for alleged improprieties in office, Bharatiya Janata Party (BJP)-led National Democratic Alliance (NDA) is convening an all-party meeting ahead of the monsoon session set to begin on 21 July. The NDA government, already under pressure over the controversy involving minister of external affairs Sushma Swaraj and Rajasthan chief minister Vasundhara Raje, who allegedly helped former Indian Premier League (IPL) commissioner Lalit Modi, foresees a likely disruption in the Parliament proceedings over the issue. This could derail the government’s plans to get legislative nod for a raft of legislations, including the goods and services tax (GST) bill. This is not the first time the government is planning to call an all-party meeting before the start of a Parliament session. A similar exercise preceded the budget session when parliamentary affairs minister M. Venkaiah Naidu convened a meeting on 22 February. Normally, the Lok Sabha speaker convenes an all-party meeting ahead of each Parliament session“We have spoken to the opposition about coordination and communication. We want constructive cooperation with all opposition parties. We believe whatever the issues are, we are ready to discuss. Unnecessary disturbances would lead to nothing; it won’t help,” said Mukhtar Abbas Naqvi, minister of state for parliamentary affairs. The Congress and other opposition parties are demanding the resignation of Swaraj and Raje. They have also demanded to know Prime Minister Narendra Modi’s stand on the entire issue. Bill, 2015, and The Constitution (122nd Amendment) (GST) Bill, 2014—that are likely to be taken up for discussion in the monsoon session.The bills are currently under consideration of two different parliamentary committees. “Whatever the issues are, these bills are not for the party, it is for the public, for the progress of people and the country. The bills that did not get approved last time, we have sent them to the select committee and a few to the joint committee. The report will come soon. We are expecting a positive outcome,” Naqvi said. The biggest hurdle for the government is in the Rajya Sabha, where it is in a minority, and a united opposition has the support of 134 out of the 245 members of Parliament (MPs). The NDA has only 63 MPs in the Upper House. Naqvi said the government will seek constructive cooperation with the opposition. “We have not shown any bad attitude. The GST bill is with the select committee as it was demanded by all the opposition parties. For the land bill also, they demanded a joint committee and the government agreed. If the joint committee gives its report, Parliament will discuss it. Whatever the issues are of the opposition, we have listened to it,” Naqvi said. Leaders of the opposition said they have not been called for any meeting yet. “They have not called so far (for the all-party meeting). Once they do, let us see what the agenda is,” said Sitaram Yechury, general secretary of the Communist Party of India (Marxist). A senior Congress leader, who did not wish to be quoted, said the party has not been called till now for any meeting. Political analysts say the Modi government is in a tight spot and calling an all-party meeting is one way to defuse crisis temporarily. “This is a mechanism of the Modi government. Opposition parties are bent on harassing on the floor of Parliament; so to avoid the situation, the BJP has taken this step. The government is panicking; it is quite clear from the reports,” said Bidyut Chakrabarty, political science professor at the Delhi University. “According to the moral standard set by Narendra Modi during elections, Vasundhara Raje and Sushma Swaraj should resign. RSS (Rashtriya Swayamsevak Sangh) and L.K. Advani are also thinking along the same lines,” he added.